It’s beginning to look a lot like…winter? Well for most of Canada, it has been winter for many a week now, but that doesn’t make the morning routine of scraping those frosty windows any easier. That is, until now. If you’ve got a gift to buy in the next little bit – say for a birthday, thank you, or congratulations (particularly for a new driver), consider snapping up today’s hot ticket item – before it disappears from the shelves altogether here in 2011! 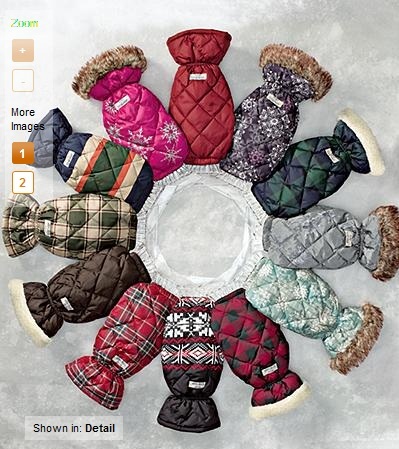 I’m talking about Eddie Bauer’s Down Ice Scraper Mitt, currently selling for just $10 online and in stores. The mitt combines the style and quality you’ve come to expect from Eddie Bauer, with functionality to the nth degree. Namely, an ice scraper is built right into the top of the mitt, with the rod nestled within the down filling where your hand is comfortably housed. Control + style + warmth = a win/win/win my friends. 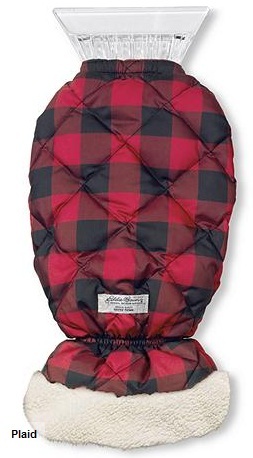 The mitts are down to just three colours now – red plaid (shown above), crimson plaid, and a berry red poinsetta shade. My mom actually got these for my dad and my sister for Xmas, so if you manage to snag a few of them now, there’s no reason you can’t stockpile them for next year’s festivities. Unfortunately retailers don’t operate on the same schedule as consumers, as evidenced by the banner on the EB website proclaiming a tad prematurely “Goodbye Winter! Hello Summer.” If you’re like the majority of Canucks out there, you’re probably scoffing at the floaty spring arrivals already cropping up in stores – but hey, the good news is at least you can take advantage of the stellar deals on winter essentials like today’s awesome mitt.